The 2018 Lincoln MKX is a mid-size luxury crossover that is distinctive by design. It comes in two different models: Select and Reserve, and can seat up to 5 passengers. Many boast about its affordable pricing, which starts at just $49,600. The minute you step into the MKX, you should feel like the spotlight is on you. Headlights illuminate, door pockets glow, and if that isn’t enough for you, a special Lincoln welcome mat shines as you approach the vehicle! The crossover offers a lot of luxury for the price tag. The Safety features on the MKX are worth a mention. These features definitely offer peace-of-mind, especially if you’ve experienced a B&E in the past. Available Enhanced Security Package includes an interior monitor system that detects movement inside the vehicle as well as when the vehicle’s angle has changed, ie: during towing or jacking. While your vehicle is locked, the enhanced valet mode also locks the radio head unit, glove compartment, and centre console via a code on the centre touchscreen! I bet you’re asking yourself, does it get any safer? It does! This package also includes double locking, which prevents a thief from breaking a window and reaching through to open the door manually. Put your mind at ease and stop worrying about potential break-ins. Aside from safety features, the MKX offers tons of storage space and flexibility. There are plenty of storage options for handbags, tablets, and other essentials that can be easily accessible in the cabin. The rear seats also fold down to include more space for larger cargo items. Did we mention it offers best-in-class second-row leg and headroom? 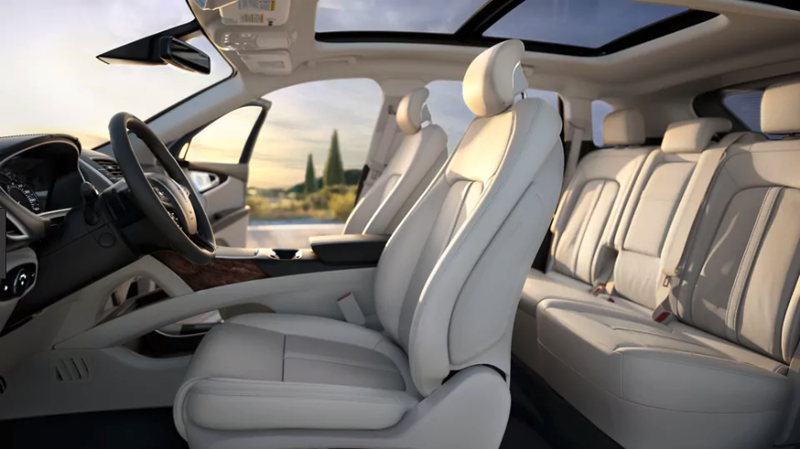 If comfort was ever a concern for you, now you won’t have to worry about long drives for your passengers – whichever seat they choose in the vehicle is a comfortable one. The 2018 Lincoln MKX offers a ton of luxurious options, as well as safety features, at a rather affordable price point. If massage chairs and light up welcome mats caught your attention, the MKX could be your next mid-size SUV. The gorgeous vehicle is designed to make every drive a liberating experience.